Introduction to Numerical Methods for Time Dependent Differential Equations delves into the underlying mathematical theory needed to solve time dependent differential equations numerically. Written as a self-contained introduction, the book is divided into two parts to emphasize both ordinary differential equations (ODEs) and partial differential equations (PDEs). Beginning with ODEs and their approximations, the authors provide a crucial presentation of fundamental notions, such as the theory of scalar equations, finite difference approximations, and the Explicit Euler method. Next, a discussion on higher order approximations, implicit methods, multistep methods, Fourier interpolation, PDEs in one space dimension as well as their related systems is provided. 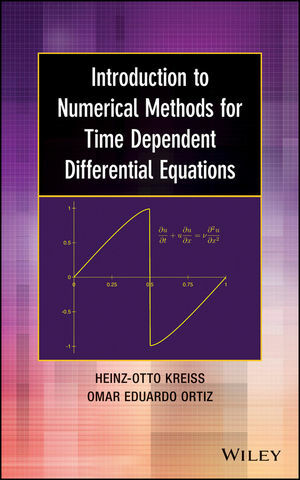 Introduction to Numerical Methods for Time Dependent Differential Equations is an excellent textbook for upper-undergraduate courses in applied mathematics, engineering, and physics as well as a useful reference for physical scientists, engineers, numerical analysts, and mathematical modelers who use numerical experiments to test designs or predict and investigate phenomena from many disciplines. HEINZ-OTTO KREISS, PHD, is Professor Emeritus in the Department of Mathematics at the University of California, Los Angeles and is a renowned mathematician in the field of applied mathematics. OMAR EDUARDO ORTIZ, PHD, is Professor in the Department of Mathematics, Astronomy, and Physics at the National University of Córdoba, Argentina. Dr. Ortiz’s research interests include analytical and numerical methods for PDEs applied in physics.